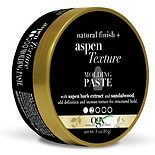 Shop OGX Natural Finish + Aspen Texture Molding Paste (3 oz. )3 oz. 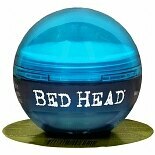 Shop TIGI Bed Head Hard to Get Texturizing Paste (1.5 oz. )1.5 oz. If you prefer a hairstyle other than the straight and sleek look, consider purchasing texture paste to keep your hairstyle the way you want it. There are a few different options when purchasing this styling product, so consider your options before investing in one. Many well-known brands make texture paste like Garnier and L'Oreal. When choosing the specific hair product to purchase, consider the finished style you wish to achieve. There are textured styling products that produce a shiny finish while others give you a matte look. For a messy hairstyle, you can apply the paste by rubbing it sporadically through your hair and touching up in areas that need it. For a twisted hairstyle, apply the texture product to damp hair and put your hair in twists. Once your hair is almost dry, use a hair dryer for a relaxed finish. In addition to using texture paste, use a extra hold hairspray to complete your hairstyle. Although the hair paste sculpts your hair into a textured style, using a finishing product helps the style stay in place throughout the entire day. If you do not want your hairstyle to be hard, opt for a soft-hold hairspray.